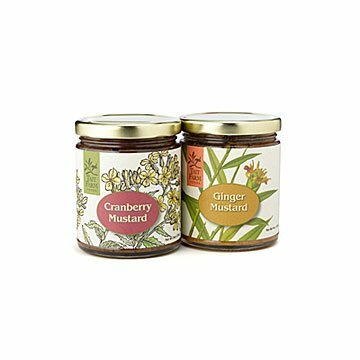 Cranberry and ginger add sweet/savory complexity to these addictively delicious organic mustards. Of all the condiments, mustard may pack the most yum per ounce. Want to argue? Try these first, then we'll talk. The cranberry flavor is like honey mustard that went to college. The tangy, astringent, sweet/sour berries give it depth and complexity. The ginger flavor is the edgy kid who went to art school: its spicy bite is masterfully balanced by mustardy heat and sweet pear. Both instantly elevate savory sandwiches to greatness (the cranberry gives it some of that Thanksgiving leftover deliciousness). Addictive with cheese, proteins, sauces, and salad dressings, they're everything else we like, too: simple whole ingredients, small-batch, family farm grown, organic. You've already forgotten all about our argument, right? Us, too. Packaged in a gift-worthy box. Handmade in Pennsylvania.